21. Januar 2016 in Administration, Programmierung. This setup codenamed „PMS“ (for PHP/MongoDB/Syslog) can be used to let one or more Syslog-servers write log messages to a MongoDB collection. They can then be accessed using a PHP web application. It has been tested on Linux using RSyslog, MongoDB, Apache and PHP (with MongoDB extension) from Devuan (Ceres). The quality of this software is currently alpha, as development is stabilizing. The user interface is not yet consistent. Attention: pms is currently in „alpha“ state. Only 1 filter field (field1) is supported. Browsing by 25 records back/forward is currently not consistent when changing to the previous hour. I recommend using this software only if you are willing to get involved with this work in progress. The setup instructions for MongoDB and RSyslog have been verified and are usable. or, if your distribution does not offer a packaged MongoDB output module for rsyslog, compile and install rsyslog manually as explained in [RSYSLOG-MONGODB]. Webserver that runs PHP scripts. 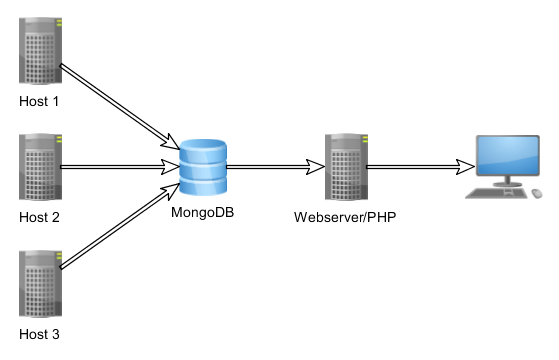 PHP with extension „mongodb“ described in [PHP-MONGODB]. Alternatively, create a „capped collection“, a feature that can be very useful for temporary, analytical storage of log messages. The capping feature will expire the oldest records when a maximum of allowed records is reached, effectively turning the collection into a large ring-buffer. Older records get expired when a defined limit is reached. This configures rsyslog to write all log messages to a MongoDB database „syslog“, collection „log“ using the database user „john“ created previously. 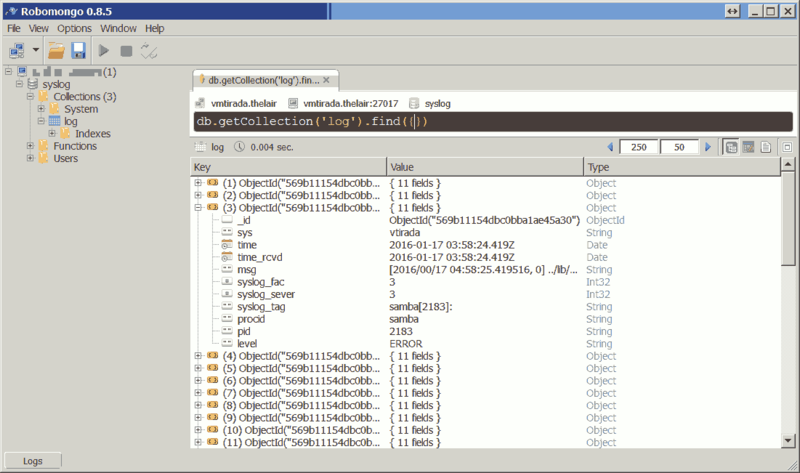 Screenshot of robomongo browsing the syslog database, showing that documents are arriving in the log collection. The software offers a simple timeline-paginated browser through a stream of log messages. Navigating through logs is done by moving forward and backward in the log messages by either 1 hour time intervals or by 25, 50 or 100 messages per page. 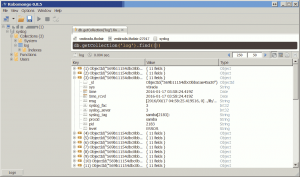 [RSYSLOG-MONGODB] rsyslog Tag Archives. mongodb. 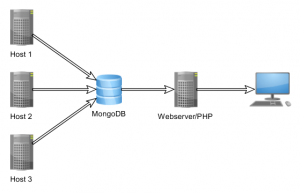 [PHP-MONGODB] PHP Manual: MongoDB Driver. kleiner Haken hat deine Anleitung – unter Ubuntu gibt es kein rsyslog-mongodb mehr … musste selber bauen … heisst also, in Debian fällt es in kurzer Zeit auch raus. Für solche Situationen ist prinzipiell der Link RSYSLOG-MONGODB gedacht. Ich werde aber noch eine Kurzanleitung zum Bau eines eigenen rsyslog-mongodb.deb nachreichen, sobald ich Zeit habe; das habe ich auf Ubuntu LTS schon erfolgreich getestet.